Rembrandt, a colt Mustang in the wild terrains of Nevada, has to learn to live without his family. After being quarantined by the land management authorities to have a better but no longer free life, he is chosen to be trained for a Mustang Makeover Competition. 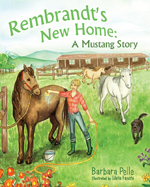 This creative non-fiction shares Rembrandt’s life in a positive way to bring attention to the life of the American Mustang. Rembrandt’s triumphant life will surely capture the hearts of all. A portion of the proceeds will benefit the Mustang Heritage Foundation (MHF).